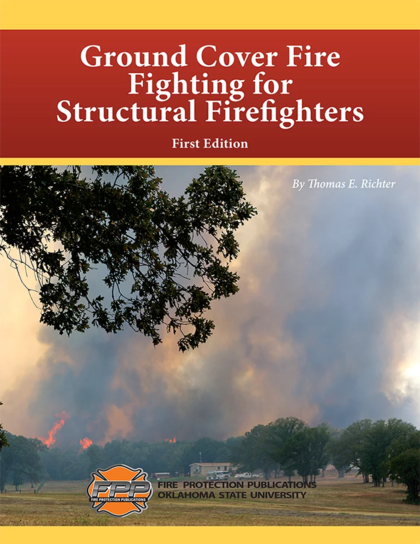 This manual is for emergency responders who encounter fast-moving fires that are commonly referred to as ground cover fires or brush fires, as opposed to forest or wildland fires. This book combines information from three trusted sources, the U.S. Forest Service, the National Wildfire Coordinating Group (NWCG), and the U.S. Department of Agriculture (USDA). The information in this manual presents organized, safe, and effective responses to ground cover fires. The standards referenced in the book are NFPA® 1977, Standard on Protective Clothing and Equipment for Wildland Fire Fighting (2016), NFPA® 1051, Standard for Wildland Firefighting Professional Qualifications and NFPA® 1906, Standard for Wildland Fire Apparatus. The book includes key terms and a glossary. Author, Tom Richter, has served the wildland community as part of the U.S. Forest Service, the Wyoming State Forestry Division, and as a member of the Illinois Department of Natural Resources Interagency Wildland Fire Program. Mr. Richter currently serves the firefighters of Illinois as the Wildland and Prescribed Fire Program Manager at the Illinois Fire Service Institute at the University of Illinois, Champaign-Urbana campus. Tom is also the Deputy Incident Commander for the State of Illinois All Hazards Incident Management Team.